Mystery Solved After 30 Plus Years! Let’s go back to the late 80’s on M-134 in the Eastern Upper Peninsula of Michigan. My family of four, which included my husband , my two small sons and myself, were staying in Cedarville at Paul’s Cabins for a week of fishing with Grandpa Tonn. This was a tradition that had been going on since being led there by good friends Dottie and Bob Fisher. This area is known as the Les Cheneaux Islands, or “The Snows”. There are several dozens of small islands that create a wonderful protected inland waterway between the Upper Peninsula and Lake Huron. The islands hold many old family cottages with extremely charming and unique boat houses. We spent the week cruising through the channels and dropping our lines for bites from perch or other pan fish. The dock in front of Paul’s ended up being the best for pike. Yes, even I caught a couple pike in that one decade of trekking up there each year after school was out. But this one particular year we were driving back from an outing at Hessel, the town that holds the annual Antique Wooden Boat Show, the 34th this past August. The sun was bright and I caught a glimmer of something on the shoulder of the road. I convinced my husband to turn around and see what it was. He reluctantly did so. As we turned and found the shiny object that caught my eye, I jumped out of the car to see what it was. 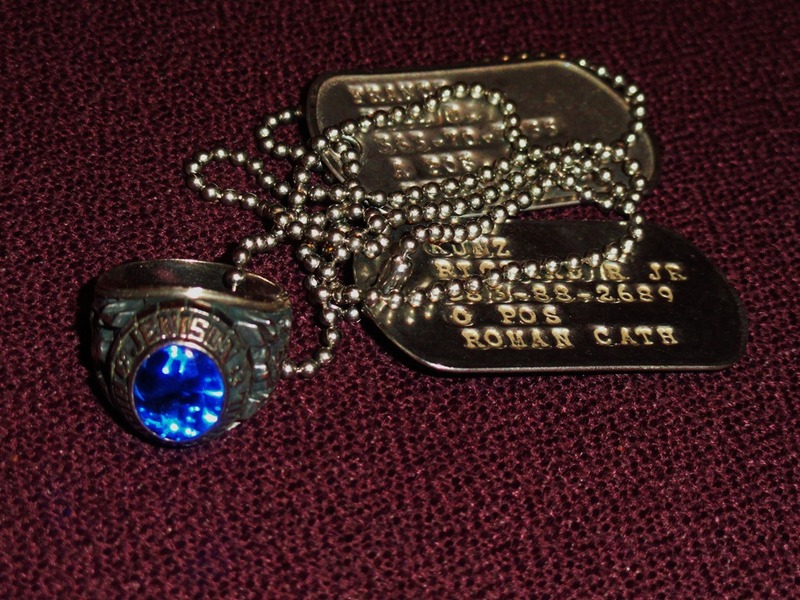 It was a man’s class ring, with a bright blue stone attached to a chain that also had two dog tags. I reasoned that someone must have lost them jogging. Cedar Campus, a Christian camp, was very close, so we thought perhaps it was someone from there. The ring said “ Jennison High School 1982. Okay, I would call the school when we got back, and see where that would lead, using the information from the dog tags. Upon returning home, I DID call the Jenison High School Administrative Building. But the nice voice at the end of the line, flatly told me that they had no way of tracing the person belonging to the ring, even thought I supplied names. In time, I gave up and hung on to the ring hoping that someday I would be able to reunite the owner with his beloved possession. So that was in the late 80’s. In my deep cleaning this past week, I ran across the ring again. So I sat down with my laptop using current searching methods, looked up the name on whitepages.com. This owner was a Jr., and I came up with a Sr. currently living in Florida. So I called hoping this was a lead in solving the mystery of ownership. No one answered, so I left a long detailed message and waited. Well, I didn’t have to wait long, I received a call the next day from the ring owner’s father. I missed his call, so HE left ME a message, saying that he was indeed the owner’s father and his son was in the military, apparently a career man, in the Army. I repeated the story of finding the ring and thanked him for returning the call. He told me his son’s birthday would be in 10 days and the ring would be a great present. He told me he had just spoken to his son that day, but did not mention the ring. He thought that it would be a good surprise in the coming week. We had a five minute exchange about living in Michigan versus living in Florida, then closed our conversation, with me promising to send the ring out on the first business day of the following week. So today, I bought a birthday card, and on Tuesday I will UPS the ring to its owner, after 30 plus years. I will also thank him for his years of service defending our country since graduating from high school. 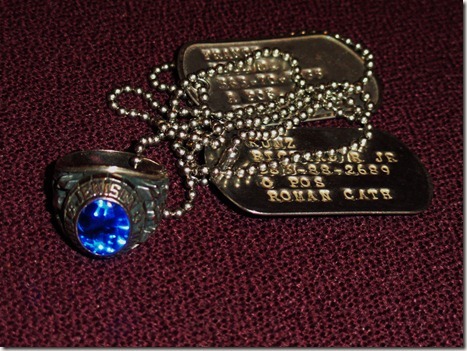 One mystery remains, why does the ring have two dog tags attached to it? Perhaps the other tag is from a fellow fallen soldier, a friend. Maybe, in time, I will know that connection,as well. But thanks to the advancements in technology, I have been happily able to drawn closure to this piece of jewelry that I have hung on to for so long.